Difficult ideas in science, history, and math come to life with 3D printing as students see, touch and explore objects they formerly could only see in pictures or drawings. 3D printing has shifted learning from a passive to an interactive process, making school fun and exciting. With the help of the following tools, you can optimize the use of 3D printers in the classroom and give yourself and your students a chance to create 3D objects that will make learning easy and fun. Tinkercad simplifies the 3D design process and makes printing very easy. When you sign up for an account, you get immediate access to dozens of lessons that introduce you to tools you can use to quickly put your 3D printer to use. You and your students can exit Tinkercad’s training classes at any time to explore your own ideas and try new features. Users can share projects, making Tinkercad an online community that supports the creative use of 3D printers. Thanks to Tinkercad, students have a way to learn about 3D design and printing without having to deal with complicated interfaces and tools. The application teaches students to combine many simple objects to create more complicated models. It also lets them learn how to use negative space as part of the design process. Your classroom can benefit from Tinkercad, even if you don’t have access to a 3D printer. After using the app to design an object, you can order a printout from within the application and have it delivered to your school. If you need a 3D modeling application that your students can use from an iPad just as easily as they can from a computer, 123D Design might work well for you. Despite having and easy-to-use interface, the application supports advanced 3D designs. Students can quickly get started with the application, share their designs and participate in online discussions. Designing with 123D Design begins with a collection of shapes that students can place into a window where they can use them to either add to or subtract from their design. They can use their iPad’s touch interface to make objects hollow, create bevels and change alignments. You can have your students save and share their projects, order prints, or send their designs to an in-classroom 3D printer. Your students will enjoy using SketchUp because of its user-friendly, forgiving interface that simplifies the creation of complicated projects. The unique blend of easy-to-use tools and advanced features works well in classrooms where students don’t have the time to learn the intricacies of 3D design. Getting started with SketchUp might require you and your students to use the app’s video resources. After watching a few tutorials, you will understand how the application works. You can use SketchUp in practically any environment to design and print almost anything. After learning how to use SketchUp, your students will learn a diverse set of skills that put their knowledge of mathematics to use. For example, students will learn how to measure and calculate geometric dimensions and space. You can use the app to illustrate and demonstrate ideas from almost any subject. You can use the Minecraft-like design tools of 3D Slash to give your students a head start in 3D design and printing. The application runs as either a web or desktop application and has simple controls that allow users to quickly create and print 3D objects. 3D Slash supplies a simple palette that uses cubes to create a simple look that appeals to most primary and secondary school students. After creating models in 3D Slash, your students can save their work and import it into other 3D design applications. They can also print their designs on a variety of 3D printers. The app comes with instructional videos and has templates and examples that give you and your students a fast path to productive 3D design and printing. Even though this is a great app for beginners in 3D printing, don’t let the simple interface deceive you. Your students can create complicated designs and enjoy advanced features that include the ability to extend the program through its API. As a teacher, you will probably enjoy using the dashboard feature that lets you track the activity and progress of your entire class. You can also designate projects for your students to work on. Gravity Sketch is another app that students with iPads can take advantage of. This 3D modeling application simplifies 3D design and its simple interface lets students quickly begin designing in 3D. Students can use their fingers to create 3D drawings using pre-defined shapes or freehand along axes displayed in their workspace. You might notice that the tools available in Gravity Sketch mimic those found in Google’s Sketchup software. You will love Gravity Sketch because of its ability to give students fast results and thereby keep them engaged. The application makes 3D designing and printing accessible to anyone without involving frustrating learning curves. 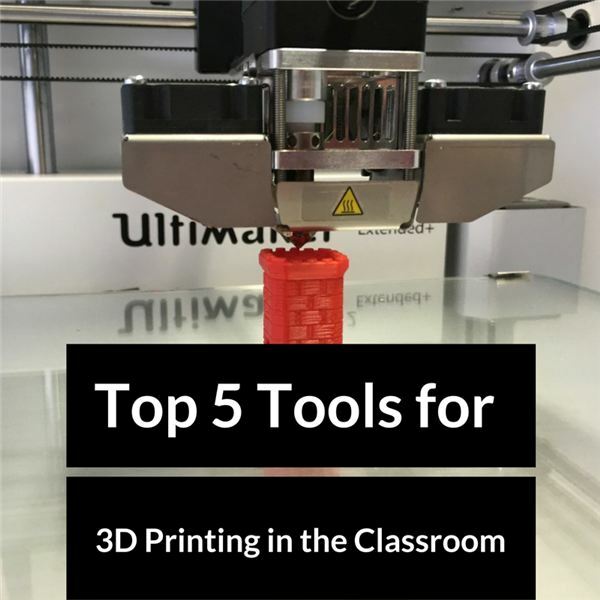 The above five tools for 3D printing in the classroom give you practical options to integrate new technology with traditional learning. Your students will learn better when they can see and hold models of classroom topics in their hands. Also, learning 3D design and printing gives you and your students invaluable skills that will last a lifetime.